Fractional Yachting…for the Time of your Life! The YACHT Solutions program is a practical boating system that allows you, as a User, the satisfaction of accessing a beautiful late model yacht without all of the hassles, headaches and expenses that can be associated with ownership. You will captain a pristine yacht – that is bigger than 90% of most vessels on the water – and you can get a minimum of 3 – 4 cruise times per month. The annual fee includes usage, slip fees, insurance, maintenance, cleaning, and management. 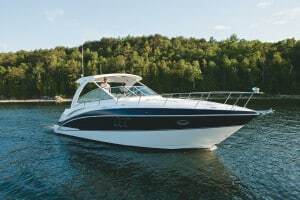 Sole ownership is great; however, if you have done any research on the costs of a new boat this size, you know that you would pay each month approximately $2500 to the bank, $700 for the slip fee and winter storage, $200 for insurance and $500 or more for maintenance, cleaning and pump outs. Plus if you are like most boat owners only end up using your new boat only 2-3 times per month. The YACHT Solutions program will bring you as close as possible to the feel of sole ownership, but will significantly reduce your responsibilities and expenses. YACHT Solutions Fractional boating is the answer with two different usage levels, Lite or Premium. Typically, busy people like you find time to use their boats just a few times per month. Perhaps you’d like to go for a relaxing evening cruise after work to unwind or maybe you’d like to take your family or friends out for a weekend adventure to Niagara on the Lake. YACHT Solutions uses a web-based, real-time scheduling system to easily and conveniently plan your cruising times for the months ahead. The Scheduler shows available times and you choose which dates are convenient for you and your busy schedule. The Scheduler updates in real time as each time slot is filled. Thus as a User, you are able to access the schedule at any time. The concept is brilliant so imagine this – you will be able to take friends, family, or clients cruising on a beautiful day, an evening, a weekend or even a full week and not only take pride in the boat that you captain, but you also have the satisfaction of knowing that you aren’t paying full price for such a luxury. 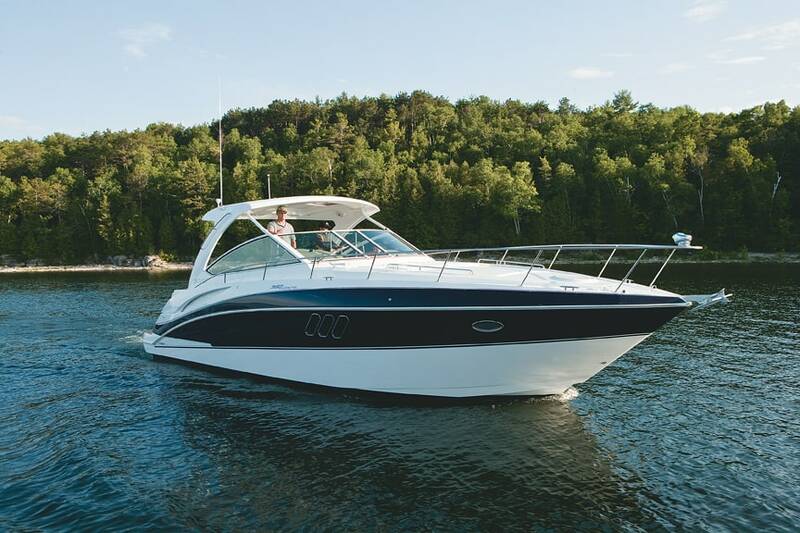 You’ll feel good about the money you will be saving on boat payments, maintenance, insurance and slip fees. How does the YACHT Solutions program work? There are a limited number of member users that can access the boat. Everyone has a predetermined amount of booking slots and the boat is professionally managed and maintained on a day to day basis. You basically can enjoy all the benefits of accessing a yacht as an owner would, but without the responsibility and high cost. Users take pride and look after the yacht as if it was their own, because they repeatedly use it and realize that they are part of a privileged group. What type of training and licenses do I require? In Toronto the PCOC, VHF license, Toronto Harbour license and our motor yacht training for that particular boat is all that is required. What is involved in cleaning up? Basic cleaning of surface areas such as countertops, seats, floors and decks that you have soiled is all that is required. Just return the boat to the state in which you go it. What if something is not working when I use the boat? We like to stay on top of maintenance issues but rely on the users to constantly give us feedback on what is not working. We make it easy to do by being able to report it on your mobile device through the reservation system or by email unless it is urgent where we recommend to give us a phone call. Can my experience on this boat help me qualify to be a captain on bareboat charters in other countries? Absolutely. The reservation system is a great way to keep track of your time in order to create a log. We also work with the largest bareboat charter companies and understand their requirement so can best assist you with getting approved with them. Membership costs vary depending on the value of the boat and how many bookings you can make. At time of writing the season memberships start at under $7,000. What is the length of the commitment of this program? One season which typically starts in May and ends in October. What is the maximum length of time a user can take the yacht for? Under the terms and conditions of the User Agreement, the user can take the boat out for a maximum of 7 continuous days by combining bookings from the current, past month and upcoming month. Can the yacht owner take all the best time slots? No, they are managed by the same terms and rules as other members and do not have any special booking privileges. The reservation system works on a first come, first served basis. Can two people share one membership? The membership is under one person’s name whom is considered master of the yacht. They are free to invite other along but the responsibility always lies under the primary membership. Can I see the yacht ahead of time? times to familiarize yourself with the vessel. What does the Ownership program entail? Owners benefit from being able to use their boat while having someone manage it and generate revenue that typically covers all the operational costs. The nature of the program lends itself to distinct tax advantages depending on the owners situation. This program seems too good to be true!. Are there any downfalls? The users must use up their time according to the scheduling terms as outlined in the User Manual. Any time slots that are not utilized are lost and cannot be carried over or transferred to another year or user. Are there any other fees that I will be required to pay? There is an initiation fee which includes the orientation and operational training on the boat. Fuel, docking at other marinas, damage and any other operational fees not covered by yacht solutions, are the responsibility of the user. Yes there is a User Agreement which can be requested for review. It protects the user and everyone involved. What type of insurance coverage is included? The user is covered the same as the boat owner. A copy of the insurance certificate is on board the boat at all times and the coverage meets or exceeds the coverage that marinas and other authorities request.